I know many of you get an exhilarated feeling when you enter a teacher store! We are teachers and somehow genetically designed to like stickers more than the average person. Bulletin board borders, dice of various shapes, the perfect poster to accompany our unit on Matter…it all gets our hearts pumping! But when you are a BILINGUAL teacher going into a teacher store and you run across Spanish materials you have an even more euphoric feeling! 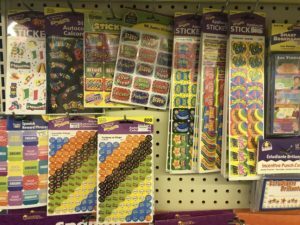 When I first started teaching in the mid 90s, payday was an exciting time because it meant a trip to the teacher store. Back then that was a Lakeshore Learning Supplies Store on Rand Rd. in Palatine, IL. The Lakeshore brick and mortar buildings closed down at some point but they still offer resources online. In 1997, a teacher store opened near my apartment in the Wicker Park neighborhood of Chicago, called Chicago Teacher Store (still open!) You could spend hours in both of these locations and find anything you needed or wanted! Then I became a bilingual teacher and all this bliss associated with the plethora of teaching materials at my fingertips disappeared. 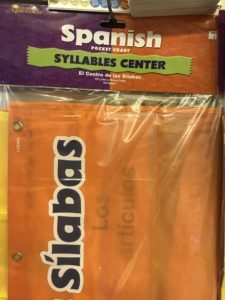 In most teachers stores, if you asked associates for Spanish bilingual materials, they would guide you to the limited area of Spanish as a Foreign Language materials, or as I like to call it the “Red is Rojo” materials. My Spanish speaking students did not need to learn red is rojo or uno, dos, tres. My students needed activities in Spanish Phonics. 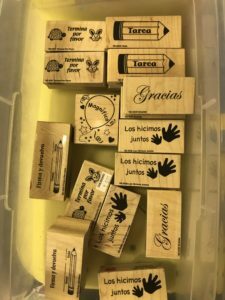 They needed access to grade appropriate authentic materials and I needed support on how to teach all of this in the Spanish bilingual classroom (read more about my struggle with this here)! When my former district began implementation of TBE programs for Spanish speakers, my co-author, Mayra was hired. Mayra and I began creating curriculum and gathering materials for our kindergarten and first grade bilingual classrooms. Going to LakeShore and Chicago Teacher was not going to get us all that was required to teach Spanish reading in the manner we wanted. We made trips to a bookstore called Las Tres Americas located on Pulaski at Elston in Chicago (now closed down). We loved the owner who was helpful and talkative! 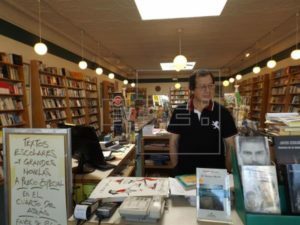 Las Tres Americas bookstore, now closed. There we found materials from Latin America that we used in our classrooms. However, we were still pulling materials from various places for activities on Phonics, Grammar and Reading. Don’t get me wrong, we used LEA (Language Experience Approach) and Dictado but we wanted something more! Well, teacher stores have evolved since the time when Maná’s “Cuando los Angeles Lloran” was a top hit! 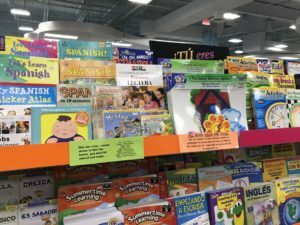 Many stores and store owners are more aware of bilingual education, dual language is on the rise and more materials can be found to support teachers! 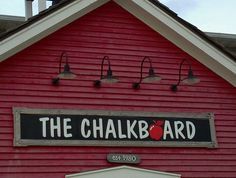 Last week, our book, Cuaderno de Actividades para Primaria Lectura, was shelved at all three Chalkboard locations! 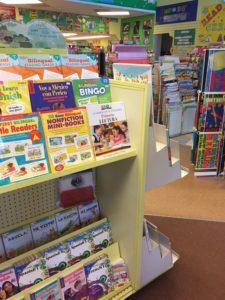 At the Crest Hill location you can find us front and center with other bilingual resources! I went to go “visit the book” at each of the locations and got goosebumps! Mayra and I are so proud and happy that more teachers will have access to the proper sequence of Spanish Phonics and authentically written materials for their beginning readers! 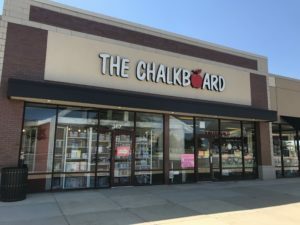 Our book can be perused and purchased at all three Chalkboard locations: Crest Hill (near Joliet), Aurora (Route 59) and Downers Grove! 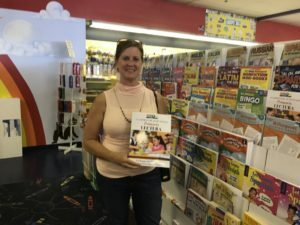 I had no shame in asking the cashier at the Route 59 (Aurora location) to take a picture of me with the book. I should photo shop Mayra in here! Aurora location has many items for bilingual and dual classrooms! 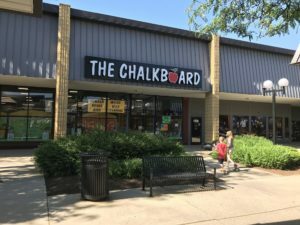 The Chalkboard location in Downers Grove is set back in the strip mall at 1524 Butterfield Road. Cute kids, no? 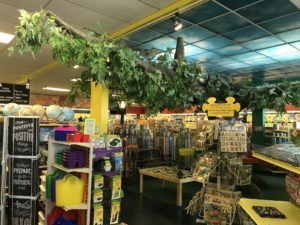 Inside the Downers Grove location. Often times bilingual materials and foreign language materials are still placed together! Please be sure to share with your bilingual colleagues both near and far that our book containing more than 50 practice lessons for primary students is available to support their teaching! 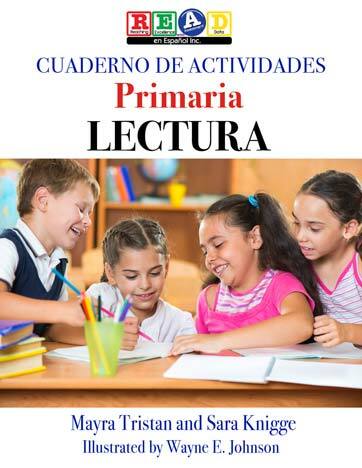 Cuaderno de Actividades can be purchased at The Chalkboard, on our secure website, on Amazon.com and even in Teacher Stores in Puerto Rico! need to pull from separate locations for Phonics, Grammar and Reading practice for their students!